The photos just get worse from here. It is a *bit* windy today, but I wanted this photographed and OUT OF SIGHT. I finished the circles yesterday and decided this morning, before the hubby got home from work (remember, he works nights), I'd get started. Never have I wanted him to come home earlier more than today. Because when he got home, I could quit! When did he get home? 20 minutes AFTER the top was together. Late. Go figure. So I've renamed it Lavender Fudge because of all the fudging I had to do to get everything to fit. Some blocks seemed to be 1/2" too large until I realized my sashing (precut) piece was 1/4" too short. Some blocks had the reverse problem... A few points were lost and a few puckers were added - do they cancel each other out? Yay for an early finish this month! Now it's back to the cows because that baby isn't going to wait for me to finish his quilt! And baking cookies. It's finally cool enough to stand the heat in the kitchen. The hubby will be pleased. Well, even with all of the problems, it is very pretty. I still like it! I can't wait to see more of the cows, it is such a darling quilt. Mmmmm cookies, I want cookies but my doctor wants me to lose some weight! I think your quilt will be beautiful in spite of all the hassles you had with it. I feel sure it will all work out, and this video proves it! You may have to copy and paste, but you'll be laughing, rather than crying when you watch it. Katie I love the quilt and the new name. It is so frustrating when the kits are not right. You did a wonderful job of fudging it to completion. It is so pretty and soft. Fudge expert now are you? It turned out lovely. 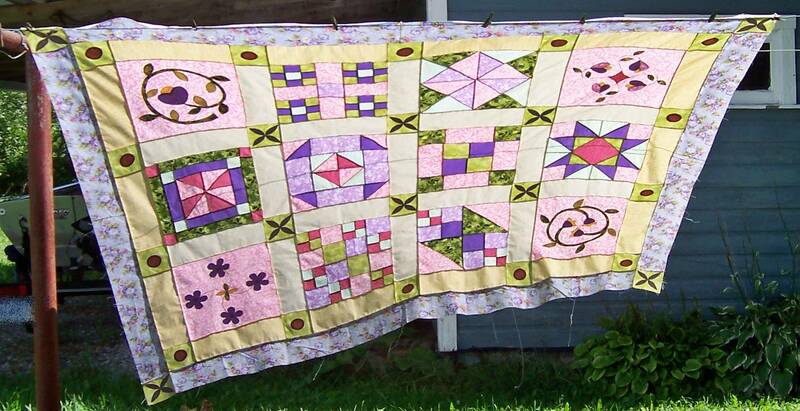 Lavender Mist or Lavender Fudge, it is still a beautiful quilt top. I hope the baby quilt is less stressful! Lavender Fudge - perfect name! Thank goodness we quilters have the "fudge" gene - I know that I use mine more than I should. ;)) And too bad we can't make the kit "makers" try to make their own kits - maybe they'd be more careful - but I think sometimes they're just hoping we don't notice. Anyway - have fun playing with the cows - that one is really cute. Fudge - cookies - and cows - what fun! Lavender fudge--such a perfect name! (I think all of my quilts should have had fudge in their names too--why didn't I think of that?!) I actually had to "gather" some of my blocks on one of my quilts to make them fit in without puckers, so I relate to your frustation on this one, but it turned out lovely! Love you comment about wanting to get your quilte photographed and out of sight! I can relate for sure! I love the pretty pastels in your quilt -- after working with dark colors for awhile it's very refreshing.